Visitors to the finance ministry seeking an appointment with the minister in charge, Arun Jaitley, are first cautioned with an unusual request. 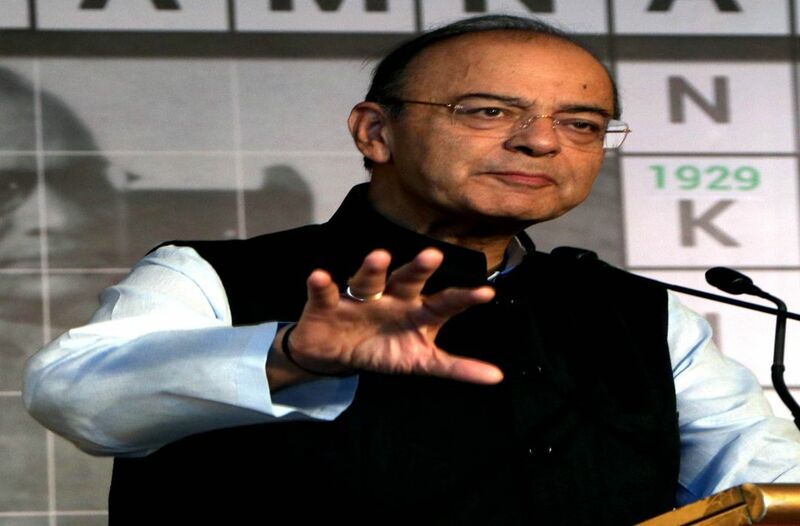 Even politicians who know Jaitley well or corporate VIPs, who have got close to him over the years, are sternly warned that there will be no handshakes or hugs. In fact, the instructions are to stand on the other side of his large desk and keep a minimum of five feet of distance. These are the instructions given by his doctors at AIIMS to avoid the risk of infection until he is fully recovered from his kidney transplant and a weakened immune system. Jaitley follows the same practice at home where his bedroom was turned into an ICU and his family and friends still maintain a safe distance. Even finance ministry officials speak to him from the door and leave files on a side table for him to pick up at his convenience. Most of them are taken home since Jaitley only works for two hours, between 10 am and noon, and works from home the rest of the day. For Jaitley, it is a dramatic change. He liked to meet visitors in a relaxed atmosphere on the sofa at the entry to his office where he used to stay late for gossip sessions with politicians, lawyers and favoured journalists. The Modi government may have stopped Kerala from accepting the Rs 700 crore that the ruler of Dubai and the Prime Minister of the United Arab Emirates offered as a grant in the wake of the flood disaster but Sheikh Mohammed bin Rashid Al Maktoum is undeterred. Through the many foundations that the royal family operates, he has sent massive supplies of relief material that would easily compensate for the loss of the substantial cheque. Sources say that over the space of one week, 12 special Emirates aircrafts carried over 175 tonnes of cargo from Dubai to Thiruvananthapuram, the nearest Emirates base to the areas most affected by the flood. The goods—food packets, dry fruit, blankets for the people in the cold hilly areas who were among the worst affected and life-saving boats to rescue the thousands marooned or still staying in shelters. While consignments were handed over to the local flood relief organisations and others involved in the rescue and rehabilitation operations, it appears the Sheikh is also keeping a close watch on the state’s path to recovery. Though the UAE has a consulate in Thiruvananthapuram, he has directed his Delhi-based ambassador to travel to Kerala and make an assessment of the state’s requirements. There is every indication that the Sheikh, who recently said that the people of Kerala “have always been and are still part of our success story in the UAE” will find ways to circumvent New Delhi’s rules and contribute on a scale that would make up for the money he promised but could not deliver. Congress President Rahul Gandhi’s hope of giving a generational makeover to the Gra­nd Old Party seems to have fizzled out. The reshuffle in the AICC and the committees announ­ced to oversee preparations for the 2019 Lok Sabha polls show that the Congress Old Guard has found Rahul to be their ardent patron. With the exception of his confidants, Randeep Surjewala and KC Venugopal, all others in the nine-member “core committee” constituted by Rahul are veterans borrowed from his mother Sonia Gandhi’s war room. These include AK Antony, Ghulam Nabi Azad, P Chidambaram, Ahmed Patel (who earlier made a comeback as the party’s treasurer), Mallikarjun Kharge, Jairam Ramesh and Ashok Gehlot. The Young Turks have been accommodated in the 19-member manifesto committee but here too the Old Guard has not been ignored. The over-reliance on veterans perhaps has to do with the fact that Rahul believes that the party must revive the ghost of the NDA’s 2004 India Shining campaign if it hopes to give the BJP a challenge in 2019. The Congress will, in poll rallies, draw comparisons with Modi’s promises of New India and the hoax that India Shining was. The poll promises, aka party manifesto, will build on the populist sops that brought the Congress to power in 2004. The sceptics in the party, however, believe that Rahul is making the mistake of seeing Modi as a re-modelled Vajpayee, removing Amit Shah’s wily machinations from the equation and being caught in the 2004 time warp sans any new vision. If the BJP high command had hoped that its pan-India “Kalash Yatra” for dispersing the last remains of former Prime Minister Atal Bihari Vajpayee would evoke sympathy and support from the masses for the saffron party, the plan seems to have backfired, at least in the poll-bound states of Madhya Pradesh and Chhattisgarh. Vajpayee hailed from Gwalior in Madhya Pradesh and had represented the state’s Vidisha constituency in the Lok Sabha before opting for Lucknow as his seat. When the “Kalash Yatra” reached Vajpayee’s home town, the Shivraj Singh Chouhan government failed to extend an official invitation to his relatives in the city to attend the condolence meet and didn’t make arrangements for their commute. Later, at another condolence meet, Chouhan and his family members were seen smiling while paying tributes to Vajpayee—an image widely broadcast by local television channels and newspapers. The party’s Chhattisgarh leaders too left the high command red-faced as senior ministers in the Raman Singh cabinet— Brijmohan Agrawal and Ajay Chandrakar—were caught on camera sharing a joke, thumping the table in front of them and animatedly guffawing while sharing the dais with the chief minister at a function to pay respects to Vajpayee. This video went viral on social media. Vajpayee’s niece, Karuna Shukla, who had defected to the Congress in 2014 after years of being sidelined by the BJP’s Chhattisgarh unit, has demanded the resignations of Agrawal and Chandrakar while asserting that the saffron party was using the BJP founder’s demise as a tool for garnering votes. Arvind Kejriwal’s Aam Aadmi Party (AAP) is imploding. It had lost its founding members like Prashant Bhushan, Yogendra Yadav, Anjali Damania, Prof Arun Kumar, Mayank Gandhi, Meera Sanyal, Medha Patkar, etc. some years ago. Six months ahead of the 2019 Lok Sabha polls, the party has now lost journalists Ashutosh and Ashish Khetan. The resignations aside, the bigger challenge facing AAP is a severe cash crunch. A source said AAP, which had fielded 432 candidates in the 2014 polls, higher than the BJP’s 428, may not have funds to field even 100 nominees in the forthcoming general election. In Delhi, a hunt for new candidates is on. Kejriwal believes that many of his current MLAs are unlikely to retain their seats and several of them could abandon ship if the Lok Sabha poll results favour the BJP. The party, till a year after its 2015 Delhi victory, was receiving huge amounts of donations. The inflow began drying up after many of the donors’ names displayed on the AAP website started receiving notices from Income Tax authorities. Earlier this year, Kejriwal decided to nominate outsiders—businessman Sushil Gupta and chartered accountant ND Gupta—to the Rajya Sabha from Delhi. Sources say the decision to favour the Gupta duo over party leaders was motivated by the hope that these men would rally some donors to AAP. The failure of the Guptas to deliver, sources say, could result in further rebellion within AAP ranks at a time when Kejriwal is dreaming of emerging as a key face of the non-NDA, non-UPA federal front envisaged by his Bengal counterpart, Mamata Banerjee. Petrol pump operators across the country have been arm-twisted into putting up billboards on their premises displaying a portrait of Narendra Modi with a message invoking the schemes his government has launched. Those who do not comply have been told by their public sector suppliers that their supply of fuel will be blocked. The verbal advisories have been conveyed to petrol pump owners by representatives of Indian Oil Corporation, Hindustan Petroleum Corporation Ltd and Bharat Petroleum Corporation Ltd. Officials from these companies have been visiting petrol pumps they supply to confirm that the hoarding has been erected and also suggest flagship programmes that should be highlighted, like the one providing LPG cylinders for BPL families under the Pradhan Mantri Ujjwala Yojana. For petrol pump owners, their only source of diesel and petrol are public sector oil firms. Confirmation of the arm-twisting came from the president of the Consortium of Indian Petrol Dealers, who revealed this sinister development to The Hindu newspaper.